Drive slowly – One of the best tips for avoiding any type of accident is to slow down. Driving slowly gives the animal a chance to make it across safely and helps you avoid collisions with the animal or another car. Start flashing your headlights – If the animal should refuse to move, flash your lights. Some animals, especially deer, freeze out of fear or because they’re fixated on the lights. The flashing may get them to move. If you’re driving at night, try to drive with your high beams on as much as possible so you can see animals more clearly. Keep an eye out for more – Finally, never assume that there is just one animal trying to cross the road. 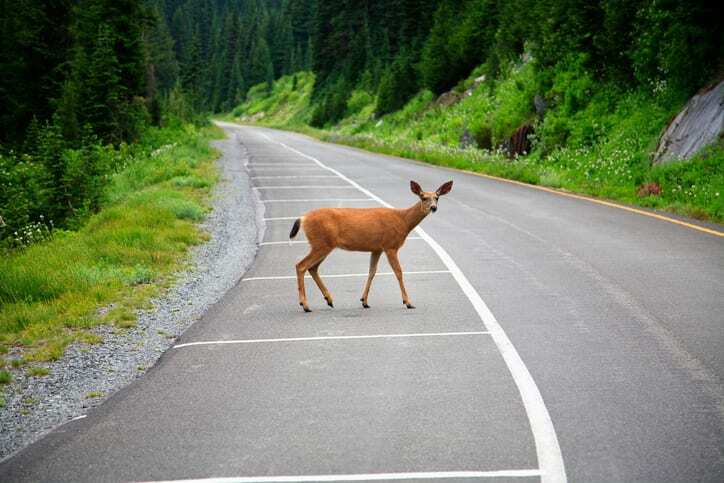 Deer often travel in a group and will more than likely cross the road together. When you see one, expect to see another. If you need auto body repair after an accident with an animal, call Carolina Collision & Frame Service. We’ll help you get your car back on the road like nothing every happened.